1 Department of Biological Engineering, Massachusetts Institute of Technology, Cambridge, MA 02139, USA. 2 Ragon Institute of MGH, MIT, and Harvard, Cambridge, MA 02139, USA. 3 The David H. Koch Institute for Integrative Cancer Research, Cambridge, MA 02139, USA. 4 Department of Materials Science and Engineering, Massachusetts Institute of Technology, Cambridge, MA 02139, USA. 5 Howard Hughes Medical Institute, Massachusetts Institute of Technology, Cambridge, MA 02139, USA. 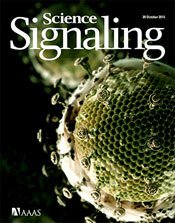 Citation: K. B. Arnold, G. L. Szeto, G. Alter, D. J. Irvine, D. A. Lauffenburger, CD4+ T cell– dependent and CD4+ T cell–independent cytokine-chemokine network changes in the immune responses of HIV-infected individuals. Sci. Signal. 8, ra104 (2015).